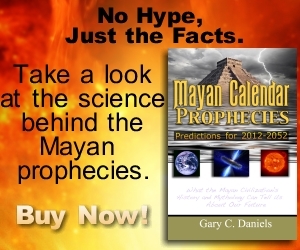 The new book, Mayan Calendar Prophecies: Predictions for 2012-2052, takes a scientific approach to the often overhyped and sensationalized topic of the Mayan calendar and 2012 prophecies. The author begins by revealing that the ancient Maya believed in a 256-year cycle that governed the rise and fall of civilizations. The Maya divided this 256-year cycle into thirteen 20-year periods called katuns. They developed predictions for each katun by looking back through their extensive written histories and finding events that seem to repeat in each specific katun. They recorded these predictions in their “prophetic” books called the Chilam Balam, books of the Jaguar Priest. The author argues that these “prophecies” were actually more like our modern scientific forecasts. For instance, scientists also look for repeating patterns in nature in order to make projections or forecasts about when such events may occur again. Unlike the prophecies of Nostradamus and others, the Maya did not claim their insights came from mystical or supernatural abilities to see the future. Instead they created a careful analytical system based on the simple idea that history often repeats itself. The author notes that geologists have found a 250-year seismic cycle that governs earthquakes and volcanoes. Space scientists have discovered a 250-year solar cycle. Climate scientists have discovered that this 250-year solar cycle affects rainfall patterns which then led anthropologists to discover that Iron Age settlements seemed to expand and contract in sync with this solar cycle due to the rain/drought cycle. Biologists have noted that insect infestations and disease outbreaks both seem to be influenced by solar cycles. Other researchers have noted that even warfare seems to wax and wane according to solar cycles. The author noted that most of the Mayan prophecies recorded in their books of Chilam Balam dealt with famines, disease and warfare. Thus the Mayan belief that such things are predictable and repeat on a 256-year cycle seems consistent with the latest scientific findings. The second part of the book takes a look at the actual Mayan prophecies as recorded in various ancient versions of the Chilam Balam. Since these predictions are cyclical and repeat every 256 years the author spends a lot of time back-testing these prophecies to see if they can, in fact, predict known events from the past. The result of this testing revealed that these Mayan prophecies were amazingly accurate for predicting events going back a thousand years. 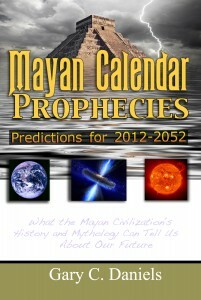 The final part of the author’s research was to utilize these Mayan prophecies to make predictions about the future. The author compared the ancient prophecies to modern-day realities and created the most likely scenarios and forecasts for the future up to the year 2052 which is when the current 256-year cycle ends. The predictions seem amazingly realistic and plausible unlike many of the ludicrous and outlandish theories being propagated around the Internet and in the news media. The most startling and apocalyptic Mayan prophecies appear to refer not to 2012 but for the time period between 2032-2052. Eerily, the author notes that NASA is currently tracking several asteroids that have a probability of impacting Earth during this twenty year time period. Overall, Mayan Calendar Prophecies: Predictions for 2012-2052 presents the most grounded and scientifically-based look at the Mayan calendar and its predictions for the future. It’s not all bad nor all good but like the last 256-years a mixture of both.